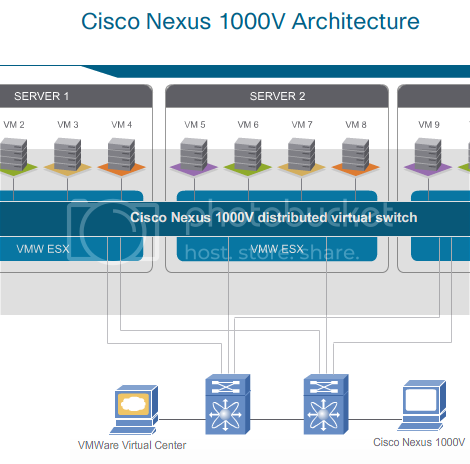 Conforming to the axiom that it's easier to join 'em than fight 'em, Cisco launched its first software based network switch this week - the Nexus 1000V - as an integrated component of VMware's ESX platform. I've written a few blogs about VMware, how it's a growing storm to traditional networking by bringing networking right into the server. This went to the heart of Cisco's business model: selling high-end LAN switches with lots of features to provide advanced networking features. With ESX's virtual switch, VMware was doing, initially at a very basic level, what Cisco has built a $40 billion business on. Cisco wasn't at risk soon, but it was probably not a good idea to wait around (just ask Microsoft about Google). So, Cisco jumped in, bought a small part of VMware, and got its networking technology inside VMware's software. The result is the Nexus 1000V. The Nexus 1000V is a two-part software solution that replaces the VMware virtual switch inside the ESX sever. 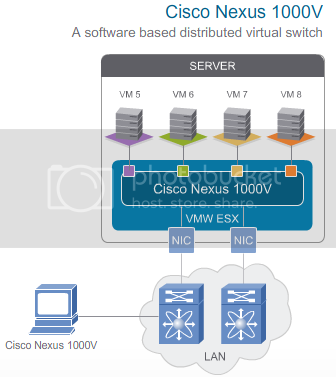 Now, instead of the virtual switch, NX-OS (and Cisco CLI) is providing networking inside the ESX server for virtual machines. The 1000V does this by integrating with VMware's new DVS API which allows external agents to provide network services to ESX. The first part of the software-only Nexus 1000V is the Virtual Ethernet Module (VEM). The VEM is the software that provides the actual networking to VMs inside each ESX server. Think of the VEM as a line card in a 6500. The second part of the software-only Nexus 1000V is the Virtual Supervisor Module (VSM). This software controls all the individual VEMs in the environment. As its name implies, think of the VSM as the supervisor module in a 6500. Put the two together and you get a single Nexus 1000V that spans the entire ESX server environment in a data center. Configurations are performed through the Virtual Supervisor Module and automatically propagated to the VEMs. Instead of configuring soft switches inside the hypervisor on one host at a time, administrators can define configurations for immediate use on all VEMs being managed by the Virtual Supervisor Module. Plus, the Nexus 1000V supports VN-link which provides stateful movement of VMs across the Nexus 1000V switch. 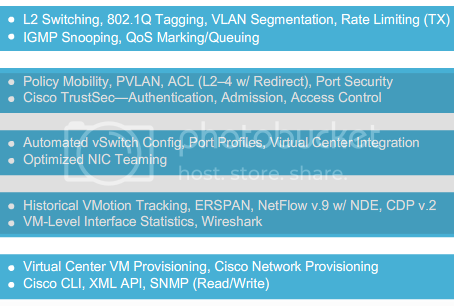 So, if a VM VMotions from one ESX server to another, all of its network attributes move too. This is not just configuration (which ESX already provides today), but also stateful operational information like port stats. Hence, it doesn't matter where the VM resides, it's still connected to the Nexus 1000V. I'll provide some commentary on the Nexus 1000V next blog.